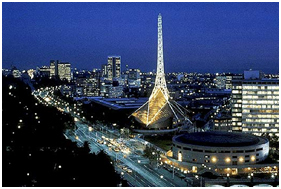 Considered by many to be the emotional heart of Australia, Melbourne offers a mix of modern architecture and amenities along with some of the most beautiful examples of Victorian architecture in the world. Shopping and food that ranges from fine cuisine to guilty pleasures can easily be found at Federation Square and the New Quay. Melbourne's population is 3.4 million which makes it the second largest city in Australia and the largest city and capital of the state of Victoria. Melbourne is a melting pot with over a quarter of the population being born overseas. There are approximately 60 cultural groups speaking 170 languages, giving this City its unique character.